The Switch Witch is the magic being that switches “extra” Halloween candy for something better. Notice the emphasis on “extra” candy. Halloween only happens once a year but a few pieces of candy can be enough to validate all the trick or treating activity, especially if the treat is not something your child usually eats. 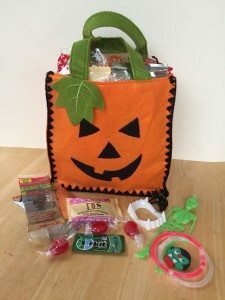 Depending on the age of your children, the something better they receive in exchange for their “extra” candy could be arts and crafts, books, toys, educational games, clothes, sports equipment, an experience like movie passes or admission to one of their favorite activities or cold, hard cash. You do not have to add an expense to your lives. The gift could be something you are already going to purchase like piano music for the song they really want to play or that new soccer ball for practice. I liked the idea of the Switch Witch because we could customize it to fit our family. If the name Switch Witch doesn’t jive with your children, other alternatives are the great pumpkin, the haggling hag, the ghost with the most, the bedtime banshee, the ghoul that rules or make up your own. I’d like to think that the Switch Witch is relative to the tooth fairy in that they both want children to be as healthy as possible, especially their teeth. I know introducing the Switch Witch as a tradition in our home has been miraculous because our children are happy and mom and dad don’t have to cringe at the thought of them eating an entire pumpkin bucket of candy. Let’s face it: most of the treats are made out of ingredients you would not want your children to eat. Focusing the fun of Halloween on dressing up in costume with your family and friends is the first step to a healthy Halloween. The Switch Witch trend is growing each Halloween and to really see all the fun details about the Switch Witch concept please click here or here.